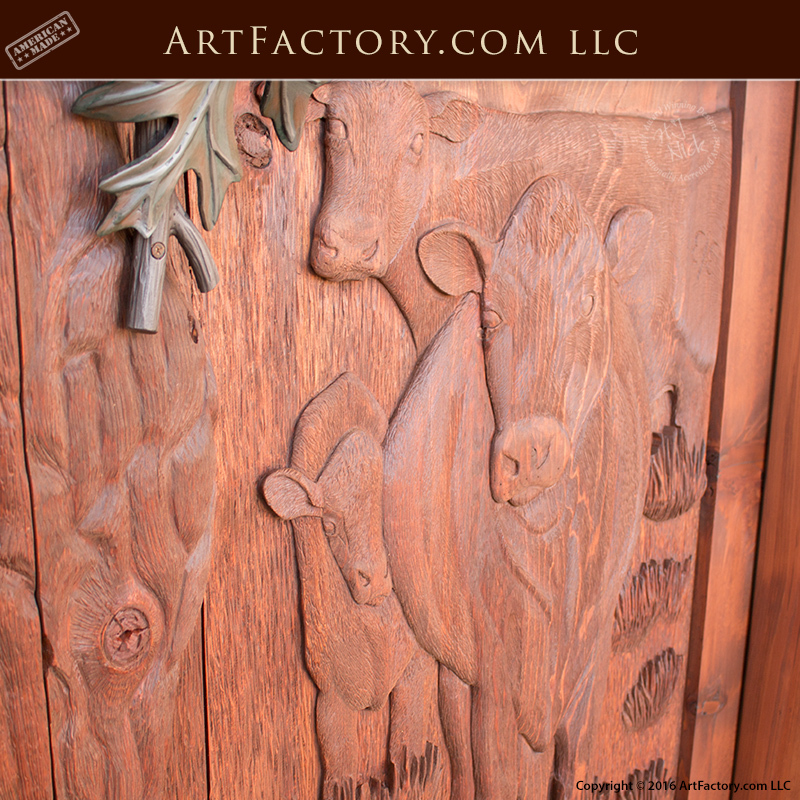 These rustic hand carved doors are a sunning example of the fine art quality designs that are handmade each day by the master craftsmen at ArtFactory.com. Custom wood doors are available for your residential and commercial entrances in any design, or theme. Your choices and options are unlimited, this includes choice of any wood type, finish options, panels, optional portals, windows, transoms, wrought iron accents and more. Our ability to design an build custom doors is limited only by your imagination. 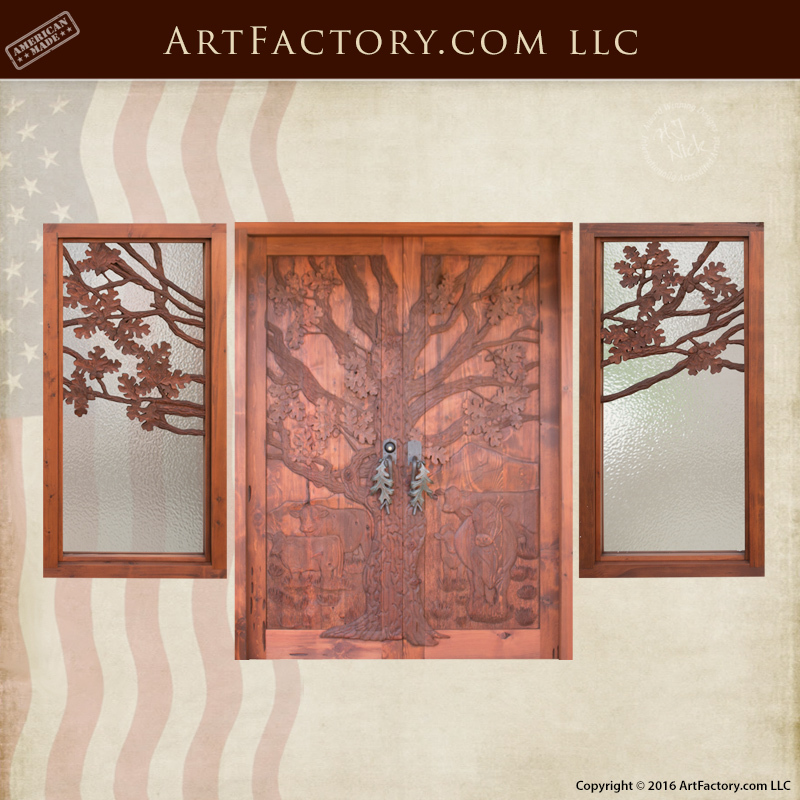 These custom double doors feature a hand carved tree with grazing cattle scene that extends into the glass etching on the sidelights.The sidelights features 3/4 inch thick, thermal insulated, tempered glass. As shown, the doors feature our oak leaf door pull. Like with all of our doors, your hardware is fully customizable, and these doors can be fitted with any handle of your choosing. This includes any of the custom door handles from our catalog, any picture or drawing that your provide us with, or any design inspired by history. These rustic hand carved doors are made from solid, full length timber, and bonded with mortise and tenon joinery. Furthermore, all of our doors are stained with a multi-process hand rubbed finish. This process ensures a finish that is blended into the grain of the wood and will not peel, flake, or fade like paint. The combination of master handcrafted solid wood, and a hand rubbed finish makes for a product that meets world class fine art quality standards. In addition, our high relief hand carving process creates both positive and negative levels. This includes features such as carved out undersides of leaves that can not be achieved with any machine. When we say master hand carved, we mean carved by the hands of one master wood carver. We do not use CNC machine carving, engage in gang carving, or any other fast process. Direct carvings by the hands of one master carver is especially relevant in the eyes of appraisers when judging a piece as meeting fine art qualifications. 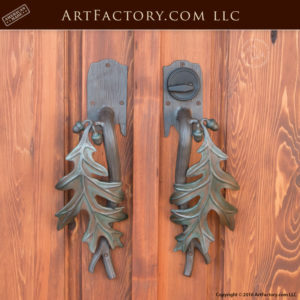 Our custom door pulls are handcrafted by master blacksmiths using hand forged wrought iron. Customizable hardware can add the finishing touches to the theme of any of our custom wooden doors. Our blacksmiths hard forge and patina finish each piece of custom hardware to perfection. Every hardware product is hand hammered over a coal fired forge, and guaranteed not to rust or corrode. Our proprietary, hand applied, heat infused, advanced patination process assures that you will have the perfect custom door hardware, and that it will stay beautiful for years to come with little or no maintenance. 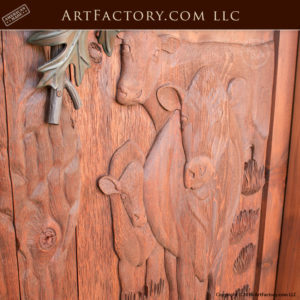 Make a statement about your personality and establishment with a hand carved door from ArtFactory.com. These wooden double doors feature dual sidelights with etched glass. The tree branch and wilderness design is hand carved into the wood by the hands of one master woodworker. Our custom wood doors are resilient to all weather conditions (even hurricanes) and become stunning additions that our customers absolutely love adding to their homes. Call us at 1-800-292-0008 to speak with one of our architects and get your custom quote today. Our combination of master hand craftsmanship, and top quality materials allow for us to offer a quality of product that is unmatched anywhere at any price. Never settle for the rest, when you can have the best, only at ArtFactory.com.